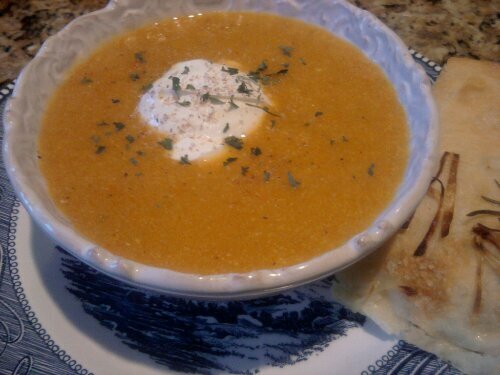 My husband makes this delicious soup when he’s feeling culinary~ish. 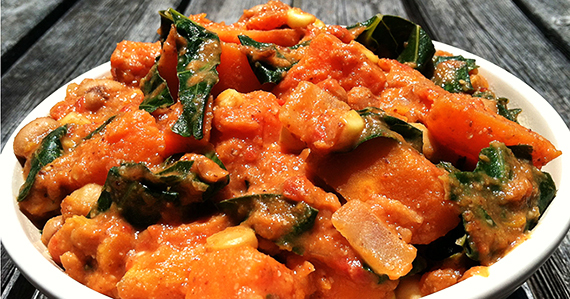 It’s super easy and super healthy and vegan too. Basically all you have to do is to sautee the onions and garlic in some EVOO in a large stock pot then add the remaining ingredients and heat through. You can garnish with sour cream and Parmesan cheese. Autumn is my season, without a doubt. It’s as if I come alive in autumn. I want to cook, nest, make things. I adore the sounds, the smells and the foods. Ah, the vegetables of autumn, especially if they are roasted. While this recipe takes a bit longer to prepare than other recipes made entirely on a stove-top, the roasting really enhances the flavor of the winter vegetables and gives it far more depth than sauteing them. This recipe will make a large batch. Probably enough to feed a large group (maybe ten) or to have leftovers to freeze. I’ve noticed a lot of recipes for squash bisque / soup call for sugar. Don’t feel inclined to add it, as the carrots and apple will give you enough natural sweetness. As always I recommend buying locally grown produce and organic whenever possible. Remember buy local, we need our farmers! Throw all of your veggies and your foil wrapped garlic on the pan. No oil is needed. Bake for approx. 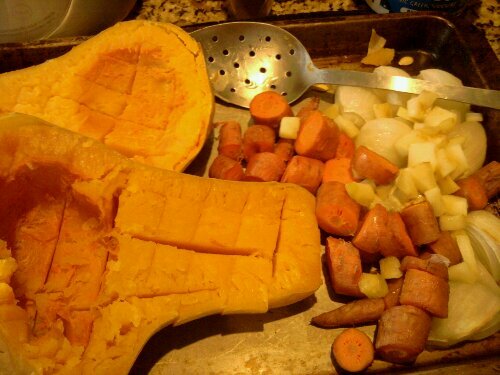 1 hour or until your squash is fork tender and the carrots can be easily cut into chunks. The roasting garlic and veggies are amazing to smell! Let these hang out and cool for a bit. When cool enough to handle, start adding these veggies and your garlic into the blender or food processor (or you can use an immersion blender if you’ve got one). I did my blending in three batches, adding some of the broth to get it blending better. **Oh by the way, if you’re using a blender take the button off the lid or you’ll be sorry. Hot food will tend to explode in the blender and make a mess. Just sayin’! I like my soup pureed pretty well. If you prefer yours to be chunkier, go for it. I transferred my soup into a crock pot to finish heating. Of course a stockpot would be fine as well. Add the rest of the ingredients, except for the yogurt. Stir that in before serving. Finish with a nice dollop of sour cream and some fresh chives. One of the dishes I crave the most is a good hot and sour soup. For some reason I thought it would be too difficult to make. So wrong! That is not to say that it’s not time consuming. It kind of is. However, so worth every bit of chopping and prep. Once it’s done, it’s a breeze. 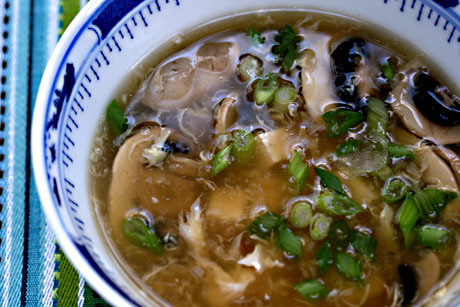 Hot and Sour soup is healthy, low calorie and great if you have a cold. It’s filled with great fungi, tofu and lean meat. What’s not to love about that? 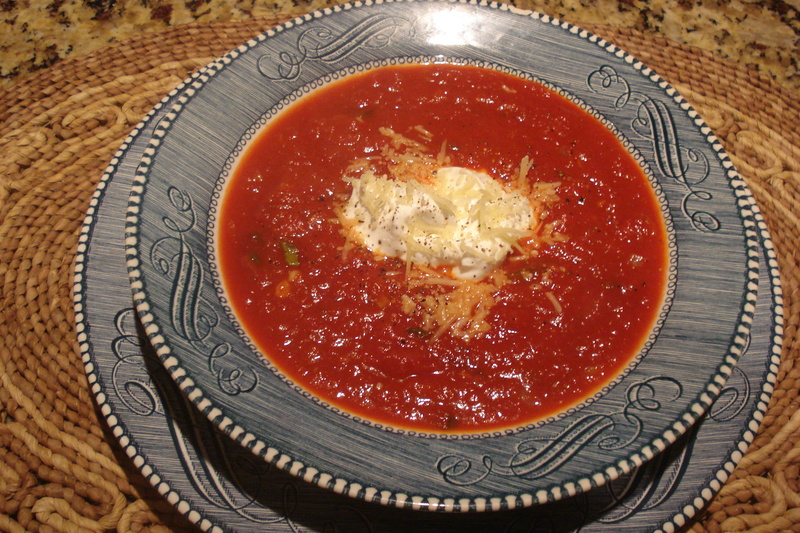 After perusing the internet and finding a few recipes I put a few together and made my own with the ingredients I most love in the soups that I’ve had over the years. Since we live in a pretty rural area and do not have a decent Asian market sadly, finding the mushrooms that most of the recipes require was impossible. So I opted to just use the fresh that I did have at my local grocery store. 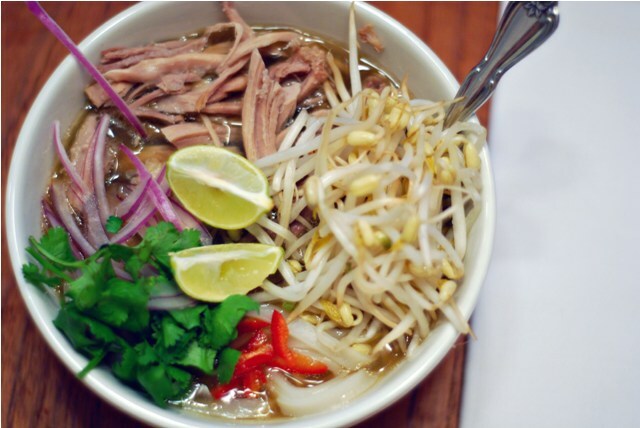 For authenticity I’ve included in the ones that I see in most recipes and have given instructions as to how to prepare it… that being said, I found that following the general directions for the broth and using fresh mushrooms was just as tasty. I even went so far as to fry up a batch of crab rangoon (recipe to follow later) and made some extra fried wonton strips to top the soup off with. Yes, it was a good night at our house! I’m pretty sure I ate myself silly that night, between my favorite soup and those cheesy, crab pockets of love! In a small bowl, place wood mushrooms, shiitake mushrooms, and lily buds in 1 1/2 cups hot water. Soak 20 minutes, until re-hydrated. Drain, reserving liquid. Trim stems from the mushrooms, and cut into thin strips. Cut the lily buds in half. In a separate small bowl, soak bamboo fungus in 1/4 cup lightly salted hot water. Soak about 20 minutes, until re-hydrated. Drain, and mince. Or if these are unavailable to you, try to find some exotic mushrooms at your grocer. I used shiitake and some other Asian mushrooms (fresh) and they tasted lovely. Remember when using mushrooms how much they shrink after cooking. Buy extra, you won’t regret it! In a third small bowl, blend soy sauce, rice vinegar, and 1 tablespoon cornstarch. In a medium saucepan, mix the reserved mushroom and lily bud liquid with the vegetable broth. Bring to a boil, and stir in the wood mushrooms, shiitake mushrooms, lily buds and bamboo shoots. Reduce heat, and simmer 3 to 5 minutes. Season with red pepper, black pepper, and white pepper. In a small bowl, mix remaining cornstarch and remaining water (again, this is only used if you have used dried mushrooms and not fresh). Stir into the broth mixture until thickened. 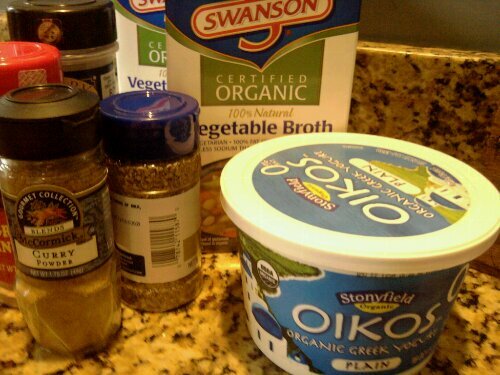 Add more cornstarch blended with water if you want your soup to be thicker. Mix soy sauce mixture and tofu cubes into the saucepan. Return to boil, and stir in the bamboo fungus, add pork and cook for 3-4 minutes, until the broth comes to a boil again. Add chili oil, and sesame oil. Just before serving, turn off the heat. Stir the egg in gradually. Garnish with green onion to serve.